I made 3 cookies the other day. Choc chips (again) biskut arab and cornflakes madu. All easy peasy recipe but yang renyah is biskut arab. Gentel je dah almost one hour and my dough turns runny. I pun memandai la tambah tepung smpai boleh shaped into small balls. Then nk bake lame gile okay dkat 40minutes for 1 tray. Tu pun tah knape die bau mcm hangit tp it still lembik je doh tu. 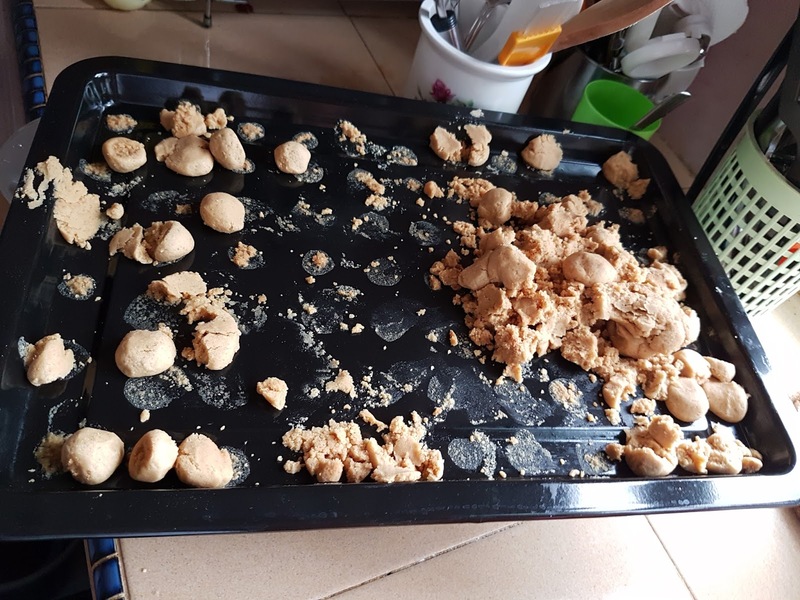 Hmm.. so I stop dulu the 1st tray leaving outside while I letak the last batch. I went into kitchen to do the cleaning but got distracted when I saw the cornflakes, so buat la kejap. Baru je start, I heard a loud PANG! Bunyi tray jatuh and hmm so I tought anak soleh punye keje. He was holding the handgloves with the tray and dough all over the floor. I was so pissed off and it get him scarred so he ran away. It was cute for a moment but I am just full of anger to even smile for that. Then it went all wrong, the last and only batch biskut arab got burned, he stole the leftover cookies and making the crumbs all over the house, throw bekas semperit while his sister tengah makan - habis hancur kuih, nak minum air but instead die pegi curah dpn tv. OMG mmg semalam die kne teruk dgn I.
I gave him silent treatment and the big sister, my lovely daughter, talked to him which I assume she asked the little brother to say sorry. Siap suruh pergi kat I and teach him to shake my hand. Aww.. I melt skejap. The boy tak faham but he follow je dengan muka kesian. Haihh laa..so I talk slowly to him and he seems understand, nod his head and responds to what I said. What a day! Husband balik and mcm biasa he sense I stressed. I told him the story smpai malam sbb I duk recall why I am so mad at him. Husband laugh and said 'Haha patutlahh mmg bnyk salah pun' Well, at least I dont feel bad about getting angry.